The Goddess Tara, in the form we know Her, is first found in early Hinduism and later made the transition to Tibetan Buddhism. 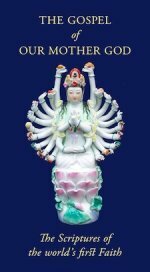 She is believed to be the most ancient form of Dea still worshipped today. The Goddess Tara is by far the most popular deity in the Tibetan pantheon: so much so that some have suggested that Tibetan Buddhism should be called Taraism. She is worshipped throughout Tibet, Nepal and much of South-East Asia. She is less known in China and Japan, but in those areas the closely-related Quan Yin (Japanese Kannon) takes Her place. Her Name means "star", and she is said to have been born from the water, like Aphrodite. Thus her iconography may be related to that of Mary, who is called Stella Maris (Star of the Sea) and foam-born Venus/Aphrodite who is represented by the Morning/Evening Star, Venus. Not only is Aphrodite connected by scholars with Ishtar and Astarte, but some have linked these names etymologically with the name of the Goddess Tara. What we have here is clearly a very fundamental symbolic – and probably linguistic – matrix of iconography related to the very earliest worship of Our Mother God, which yet remains in continuous practice through the worship of the Goddess Tara, the Bodhisattwa Kuan Yin and, in the West, the officially non-Divine Mary, Who nonetheless manifests all the symbology of the Mother-Creatrix. Other occurrences of the name Tara have been noted, including the Taramata (Mother Tara) Festival held in ancient Athens and even Tar, the Woman of Wisdom in ancient Finnish mythology. Goddesses of similar name and star-association have also been noted in Africa and the ancient Americas. With such a widespread and ancient cultus we are clearly dealing with associations that go further back than any established historical or linguistic connexions and cannot look to modern scholarship to confirm all of them, particularly the extra-Eurasian occurrences. But great ancientness seems to be very much associated with the Goddess Tara. The Finnish Tar is said to be five million years old, while in the early Sanskrit tradition Tara (the noun "tara" means to this day "star" in all Sanskrit-based languages) was also called Dhruva, the Pole Star. Now Polar Symbolism is known to characterise the early Ages of the Historical Cycle, having very anciently taken priority even over the Solar Symbolism of more recent world-eras, both matriarchal and patriarchal. Thus the Tara/Astarte-Aphrodite/Mary Form of Dea appears to have a continuity from the very remotest Ages of human history. On the identity of the Goddess Tara with Mary, no less a traditional patriarchal authority than the Dalai Lama has made an authoritative statement. 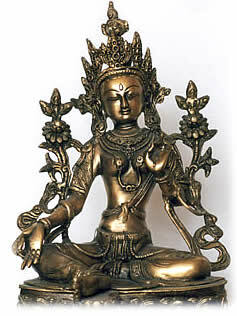 Speaking of rangjung – the miraculous appearance of images of the Goddess Tara out of living rock – and similar phenomena connected with the Virgin Mary, His Holiness said: "Yes, this would be rangjung, the same thing as we have been talking about, of course, the same thing" and again: "Yes, Tara and Mary create a good bridge. This is a good direction to go in." For the Déanist wishing to worship Our Mother God outside the context of patriarchal religion, the Goddess Tara makes a valuable point of approach, connecting living Western iconography as preserved in devotion to Mary with living Eastern iconography, both of Tara and Kuan Yin, and of the Great Hindu figure of the lotus-throned Mother Goddess. The Tibetan/Nepalese figure of the Goddess Tara has a providential centrality, lying at the nexus between the Indo-European and East Asian worlds both geographically and culturally. Her connexion with Quan Yin to the East is undisputed, and H.H. 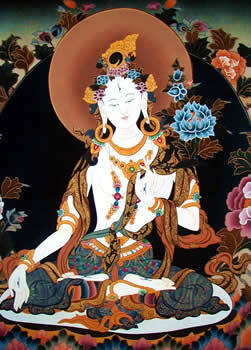 the Dalai Lama has authorised a Virgin Mary Purity meditation for those seeking to assimilate White Tara to Lady Mary. We regard this as important, not because we place ourselves under patriarchal authority, but because we are well aware that an incautious modern Western-style syncretism, which ties together images from various traditions with a variety of notions, gleaned from western political ideology, individualist psychology and popular "science", can be at best futile and at worst dangerous. We wish, and determine, to worship the One Eternal Dea as She was worshipped from the beginning; but we must also be humble enough to realise that we do not possess a living tradition and to proceed with caution, reverence and humility, leaving our modern Western notions – our noisy rebellions, superstitious awe of material "science" and individualist pride – firmly outside the door of the Temple [see further discussion on this]. That an incarnate representative of Dea – even in a patriarchal stream – should confirm and underwrite the identity of the Goddess Tara with the Western image of Mary allows us to be confident that we have here a living ritual actuality that goes back to the deepest roots of the Mother Religion. This is something far deeper and more trustworthy than the glib syncretism of Western "New Age" thought. We are not recommending the adoption of the Buddhist path. 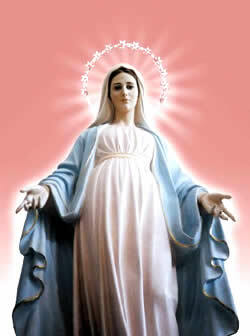 We are, and have always been, pure devotees of Our Mother God. We are also humble enough to recognise our lack of a living tradition in this world and to realise that spiritual practices and influences do require living transmission. That is why, while we consider ancient Goddesses from no-longer-living traditions to be important for purposes of comparison and understanding of our religious roots, we always recommend the use of images from living traditions for actual devotion. Images of Mahalakshmi, Quan Yin, Lady Mary and the Goddess Tara do not involve the adoption of Hindu, Buddhist or Christian doctrine, but they do allow us to connect ourselves to living and current streams of Our Mother's Grace. The assimilation of White Tara to Lady Mary, sanctioned by the H.H. the Dalai Lama, clearly allows for a devotion that is not strictly Buddhist nor doctrinally Christian, but which draws on the profoundly ancient iconography common to both, which goes back to the very roots of the Mother Religion. Our greatest trust of all is in the infinite love and compassion of Our Mother God to accept her lost little children who wish to return to Her, even though we have no living tradition, no authentic ritual method, no authorised succession of priesthood. We have come to her with a simple "protestant" style of devotion, not pretending to efficacious or sacramental rituals, which can only be transmitted by an authentic disciplic succession. The succession of the Children of Dea was broken long ago, and modern claimants to such a succession bear the all-too-clear stamps of a very modern and very Western origin. While we strive for all the wisdom we can, we must put our faith in simple bhakti the pure love of Our Mother God and trust in Her love for us. At the same time, the emergence of rangjung – perfect appearances of the Goddess Tara from the living rock – and similar phenomena related to Lady Mary, and the even-patriarchally-authorised assimilation of the two is surely an Act of Divine Compassion taking place in this very generation. We have turned in prayer to Our Lady, and, like a loving Mother, She has reached down to take our hand. Goddess Images: On the use of Sacred Images for devotion.